The scheme called Rosebank Works is on a wedge-shaped site beside the Great Western Railway and has been designed to diminsh in height to fit in with the local neighbourhood. 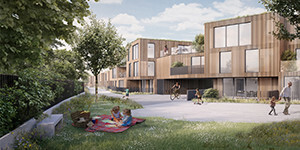 The new homes range from four-storey apartments to one- and two-storey mews houses towards the thinner end of the wedge-shaped site and are clad in timber hardwood, reflecting the meandering garden design concept. The wooden configuration will wrap around the scheme to create openings and closures within the façade. To contrast a metallic finish will be used for the circulation areas and walkways.